Annabelle Writer, 11, Desiree Garcia, and Evelyn Garcia, 10, from Girl Scout Troop 168 sell cookies to Cindy Zamora and her daughter, Sophia, 3, from Donna at the Walmart on Trenton and McColl Roads on Saturday Feb. 3, 2018, in McAllen. 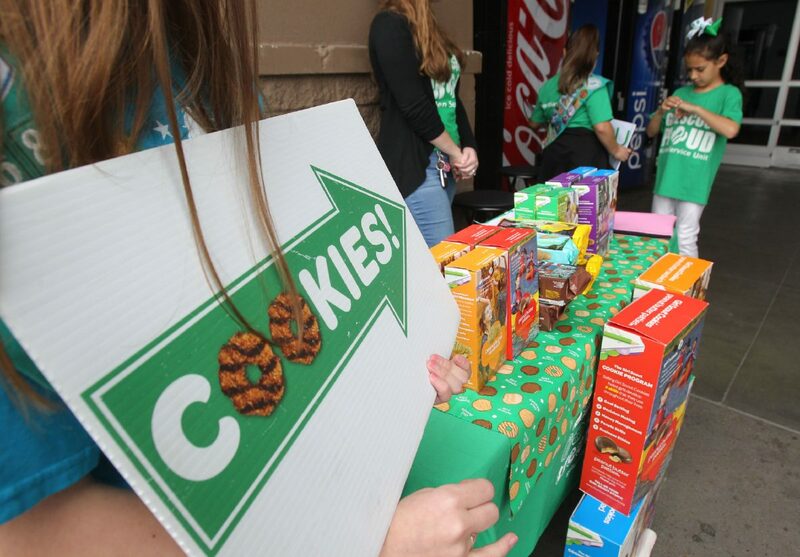 McALLEN — Behind that $4 box of Thanks-A-Lots or Caramel deLites is a Girl Scout and future world leader. It’s that time of the year when troops are stationed outside of businesses selling boxes of cookies to raise money for field trips, camps and other fun and developmental opportunities — but 11-year-old junior scout Annabelle Writer is on a greater quest. The fifth-grade IDEA McAllen student and entrepreneur is on a mission to feed the homeless in the area. One of the patches on her well-decorated green sash is the “Heart for Homeless.” Writer earned it after volunteering with her troop of 12 at Emily’s Meals, a local organization that provides meals to the hungry every day. With the help of her troop, 40 meals were served. They remained present for the distribution and were amazed by how many hungry and unsheltered individuals there are in the community, according to her mother. Ananbelle Writer, 11, Desiree Garcia, Evelyn Garcia, 10, Laura Writer and Emma Flores, 7,from Girl Scout Troop 168 sell cookies at the Walmart on Trenton and McColl Roads on Saturday Feb. 3, 2018, in McAllen. 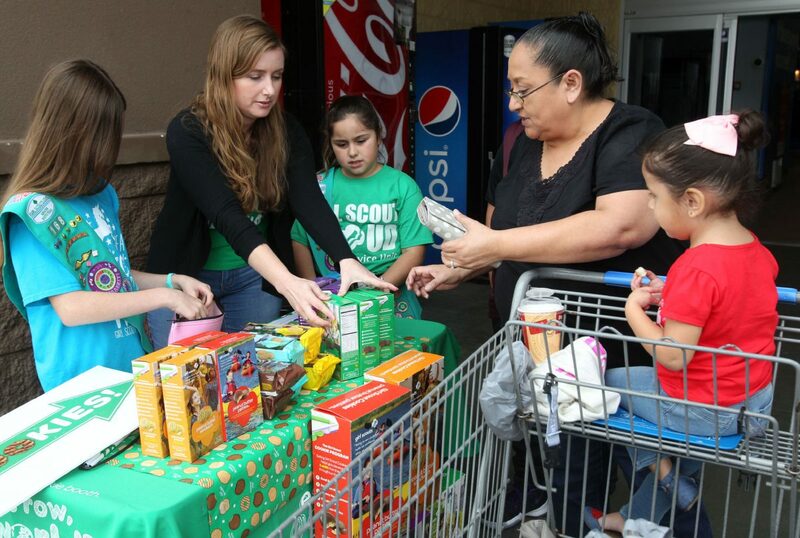 Girls Scout Troop 168 members sell cookies and spread the message of giving to customers at the Walmart on Trenton and McColl Roads on Saturday Feb. 3, 2018, in McAllen. Through this experience she came across The Little Free Pantry, an effort managed by a 13-year-old McAllen resident, that stocks items to feed the hungry. “I decided I wanted to help,” she said. Troop 168 meets every other weekend to discuss upcoming community events and find volunteer opportunities and with cookie-selling season underway, the second-generation scout started planning. Writer set the goal for her and her troop is to give 300 boxes of cookies to the organization, which can be accomplished through collected donations from the community. In order to reach this figure, she travels door to door after school on her bicycle to share her mission and request donations. 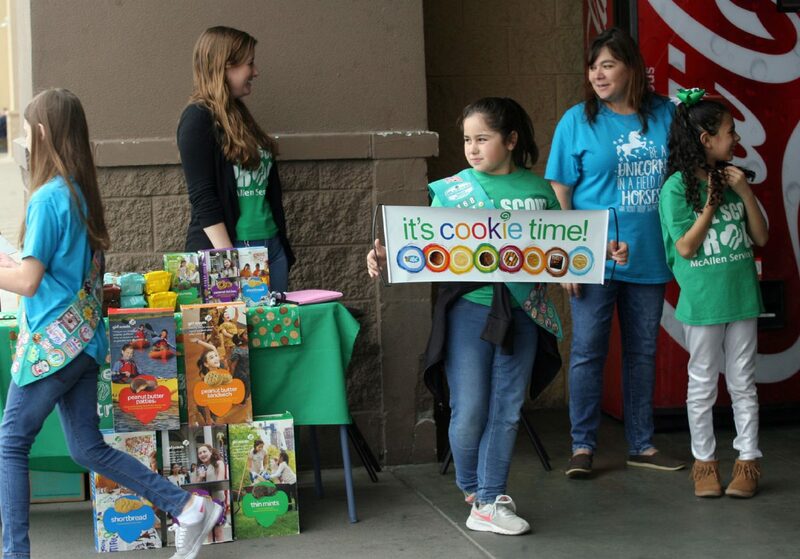 On weekends, her troop sets up cookie booths outside of shopping centers. With the help of her mom — Troop 168’s leader — she has reached out to local officials and businesses and created cookie business cards and signs in which they have coined the hashtag #morethanjustcookies. Writer said her involvement in Girl Scouts has taught her how to be a leader to her peers and younger brother. “ I became vice president of student council at my school and I talk in front of people and tell people how to help others,” she said. Not yet sure of what she wants to do when she grows up, one thing is for certain—it will involve serving others. Now in her sixth year of scouting, Writer logs all her hours and is working her way toward the Bronze Award. To support the local cause and pledge a donation, Writer and her troop can be reached through troop168mcallen@gmail.com. Cookies are sold and the mission will continue until Feb. 25.